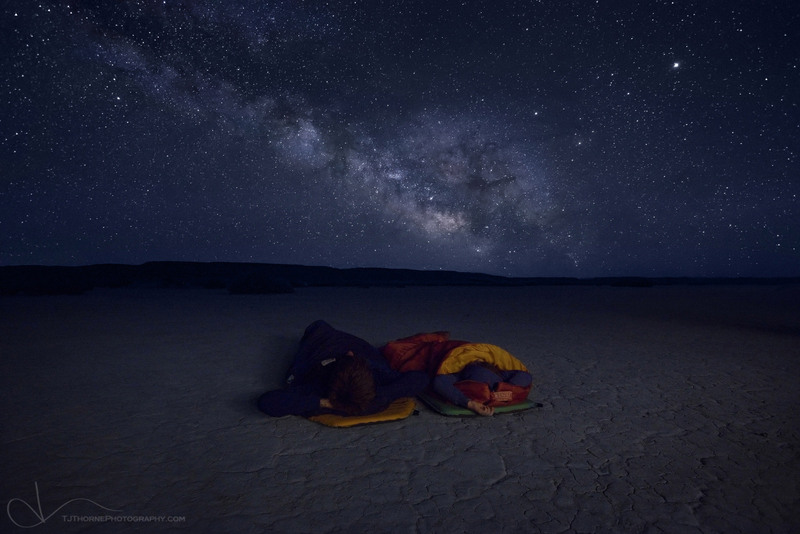 My son Elliott and I lie beneath the starry sky on the Alvord Desert Playa, Oregon. In early June 2016 I dragged my son to the far southeastern corner of Oregon to hang out with some friends in the Alvord Desert. I was a little hesitant to do so because as with most 8 year olds, the idea of hanging out in a flat, dry, hot, and dusty playa with no shade and a bunch of adults wouldn't sound like a ton of fun. But regardless, we packed our sunscreen, hats, and camping gear and made the 7.5 hour drive. Elliott tends to dislike the drives because he easily gets motion sickness. We rarely go on long trips and this was by far the longest he and I had ever done together. He gave me some attitude about it and he didn't feel well for part of the drive, but it all changed when the land opened up and we traded the billboards and city buildings for rolling hills, small towns, and grazing cattle. He seemed more engaged in the experience and the questions about 'how much longer' became farther and farther apart. He ended up having more fun than I ever imagined he would. Maybe it was because I let him drive a car for the first time on the 8 mile by 10 mile wide playa of absolutely nothing, maybe it was the open sky, quiet air, and extremely distant hills. Maybe it was the wind that tossed his kite into the air, shooting his slingshot, or the wild horses. Maybe it was drives with friends down four wheel drive roads into distant basins and seeing the beauty of the outdoors in such grand scale. Maybe it was just being in the moment with his dad far away from home and the thrill of adventure. Whatever it was.. Elliott had the time of his life on this trip. This photo was taken on our first night in the desert. The Alvord Desert is one of the darkest places in the lower portion of the United States. The remoteness of the area combined with a new moon provided unrivaled views of the night sky. As the night wore down, our collective eyes turned upwards and we pondered our place in this universe, or at least I did. Elliott wanted to lay down but didn't want to lay in the tent alone. So we dragged his sleeping pad and bag out and he fell asleep with this hands behind his head gazing up at the Milky Way. I took the time to lay next to him for a bit while my friend Bruce Couch tripped my shutter. At 5am, after I had carried him to the tent, Elliott woke up to use the 'bathroom'. The sun hadn't risen and nobody was really up, so he was all alone out there as the land began to wake up in that early blue light. He crawled back into the tent with a little smile on his face. Thinking what most parents probably do when they see that mischievous smile on their kids faces, I asked him "Why are you smiling? What did you do?" His response was "Nothing. I'm just really happy we came here. It's so beautiful." My heart melted. My eyes welled up. He finally felt a little bit of that inner peace that I feel when I'm out in nature. I reached out and ran my fingers through his hair and responded "Me too, buddy. Me too." This is the most special photo that I've ever taken. My son and I laying under the Milky Way in a place that we both love, a place where our hearts grew alongside each others, and a place where he finally 'got it'. I'm looking forward to many more moments like this with him. THIS is living.